This hard-hitting treatment with stimulate the scalp and encourage new,healthy hair growth. 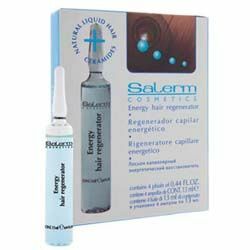 Provides active substances that ensure the correct functioning of the hair follicle,speeding up the normalization of the scalp and hair bulb. Combination of vitamins and amino acids: provide the hair and scalp with nutrients that revitalize and invigorate. Snap off the tip of the vial and apply to damp hair. Massage gently to stimulate scalp circulation. Do not rinse.